Divided back, Real Photo Postcard. 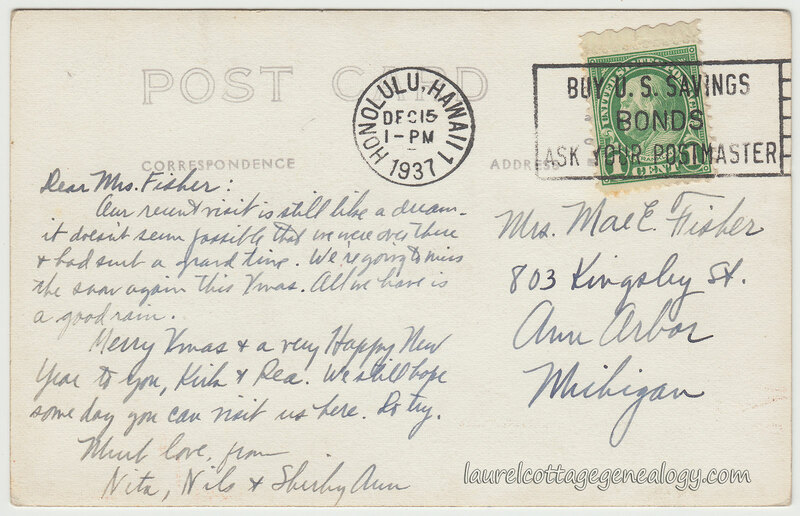 Postmarked December 15, 1937, Honolulu, Hawaii. 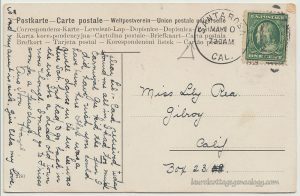 Addressed to: “Mrs. 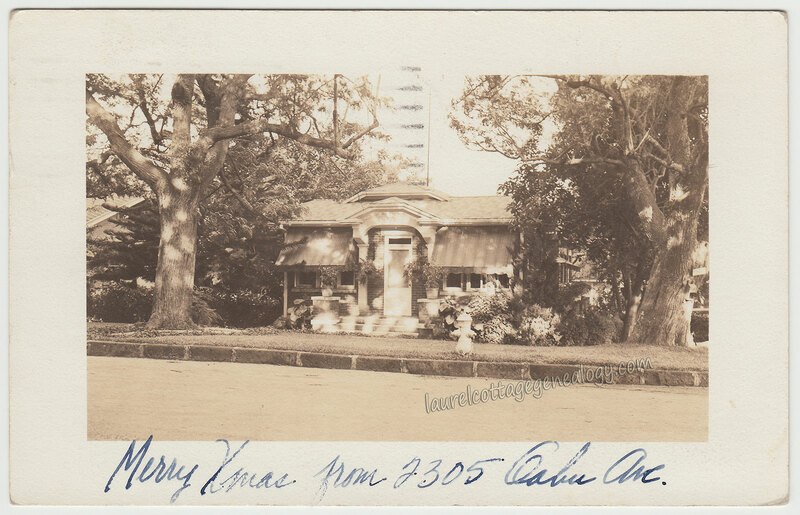 Mae E. Fisher, 803 Kingsley St., Ann Arbor, Michigan.”This postcard is the perfect segue from our last post, set in Honolulu, to welcome our Christmas offerings for this year. 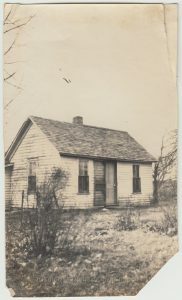 And from an internet search, it appears this home, sadly, no longer exists. But it was a beauty, cozily nestled between two grand, I’m thinking oaks, but no idea really, and a beautiful big evergreen. Don’t you love the striped effect on the curb, and is there a sidewalk in there somewhere? Anyway, the family living here at this time is attorney Cyrus Nils Tavares, born in Hawaii about 1904, his wife Unita (Gillet) Tavares, born in Michigan about 1908, and their daughter Shirley Ann, born in Hawaii about 1928. 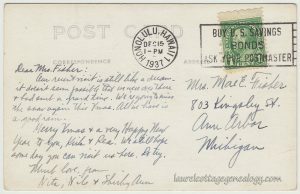 The recipient of the postcard is Mae E. Fisher, widow on the 1940 Federal Census, born in Michigan, about 1873, her son Kirkland, born in Ohio, about 1905, and Kirk’s wife Rhea, born in Michigan, about 1908. 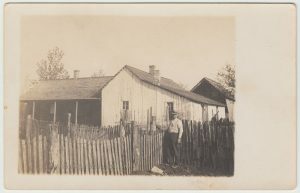 Sources: Michigan Department of Community Health, Division of Vital Records and HealthStatistics; Lansing, MI, USA; Michigan, Marriage Records, 1867-1952; Film: 223; Film Description: Washtenaw (1927 – 1933). Year: 1940; Census Place: Ann Arbor, Washtenaw, Michigan; Roll: m-t0627-01823; Page: 19B; Enumeration District: 81-25. 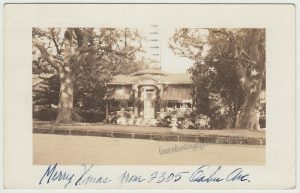 Year: 1940; Census Place: Honolulu, Honolulu, Hawaii; Roll: m-t0627-04585; Page: 1A; Enumeration District: 2-43. 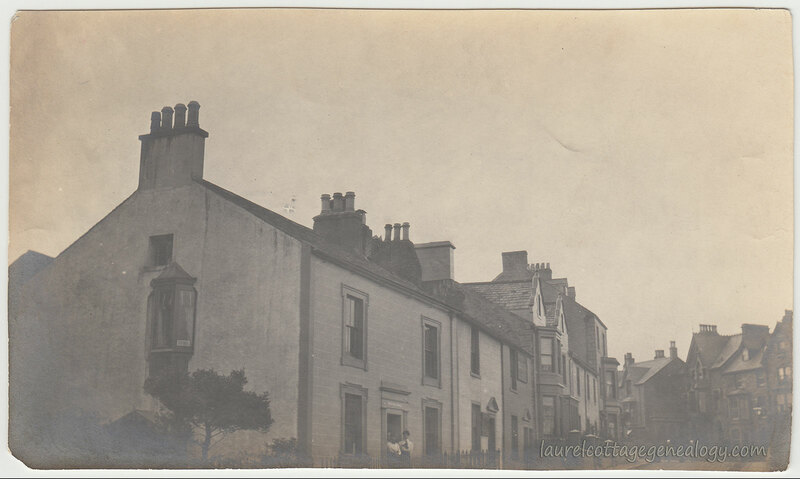 Old photo, circa 1900, Penrith Road, near Station Street, Keswick, England. Click to enlarge the image to see the people posing on the door’s threshold. 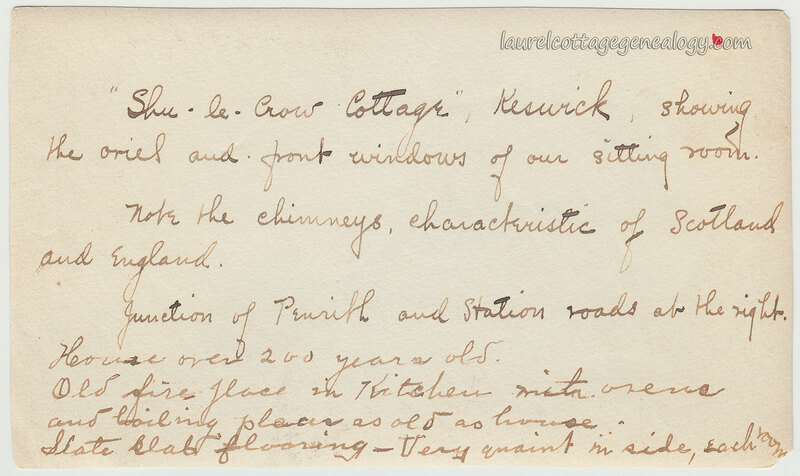 Above them, but pretty hard to make out, are the words, “Shu-le-Crow Cottage.” Happily, the “cottage” is not only still standing but still (as far as we can tell) displays its name above the door today. See the August 2016 Google map of the building in pink and street view. Sources: Craven, Jackie. “The Oriel Window – An Architectural Solution.” ThoughtCo, Jun. 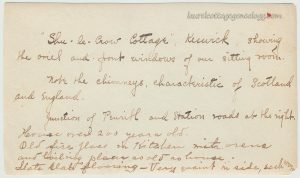 22, 2018, thoughtco.com/what-is-an-oriel-window-177517. 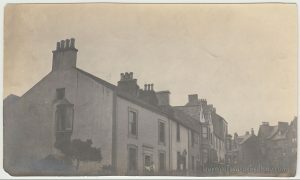 “A5271 Keswick, England street view.” Google.com maps. August 2016. 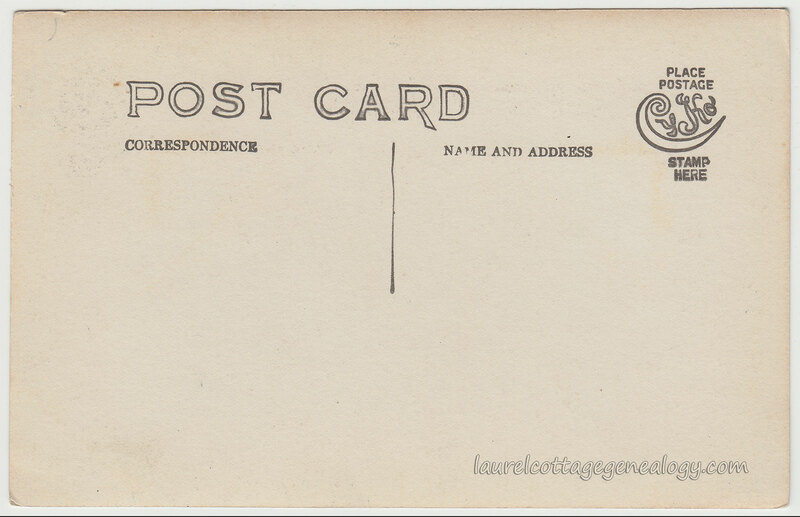 Divided back postcard. 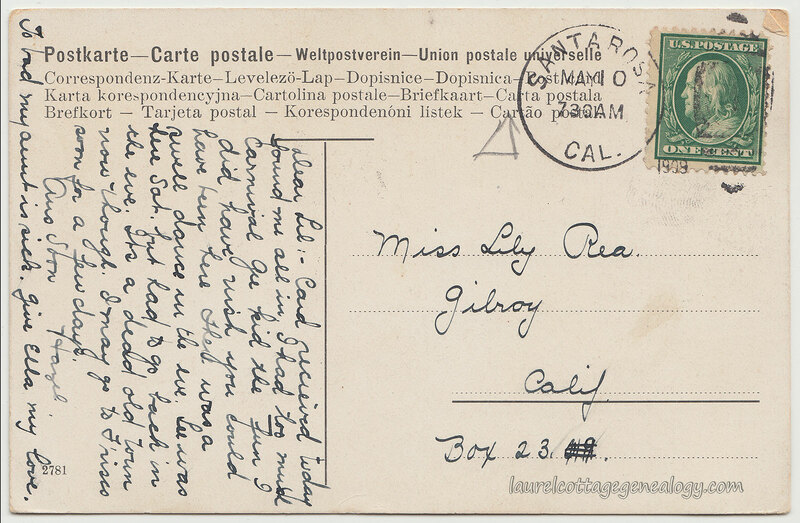 Postmarked May 10th, (year missing) from Santa Rosa, California. Printed in Germany. Publisher unknown. Number or series: 2781. 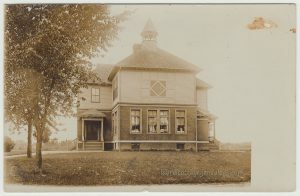 Circa 1907 – 1914. Only the postcard artist knows for sure? Lastly, while googling “thatched roofs decorations” we were happy to discover that thatching is still alive and well today. 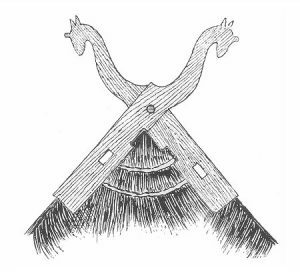 And check out these modern-day examples of thatch ornaments from some of the master thatchers in the UK, Brian and Tom Mizon. Sources: “Straw Finials / Straw Animals / Straw Ornaments.” http://brianmizonthatching.co.uk/ (accessed October 8, 2018). 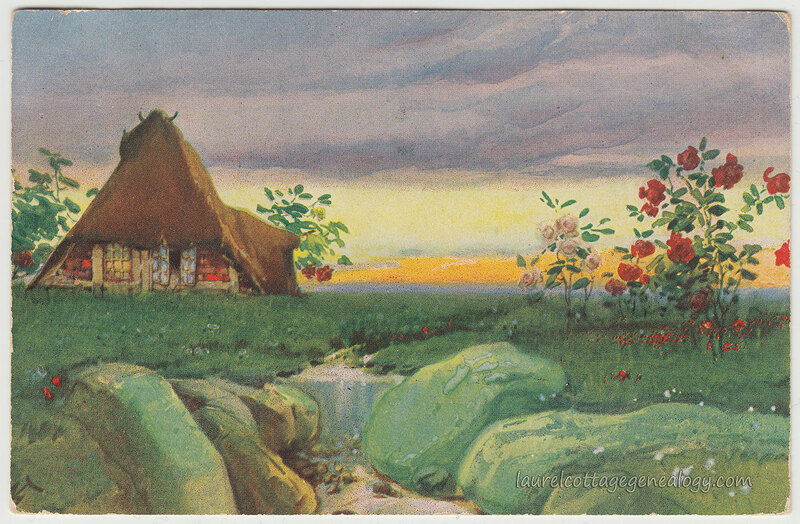 Low German house. n.d. https://en.wikipedia.org/wiki/Low_German_house (accessed October 20, 2018). Divided back, unused Real Photo Postcard. CYKO stamp box. 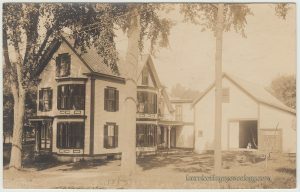 Circa 1907 – 1915. We’re not house experts here at LCG, but feel pretty confident we’ve got the right i.d. for this house style: If all four sides of the roof slope downward toward the walls, that’s the definition of hipped. We can see that the front and sides do, and are having a difficult time imagining the back not doing the same, thusly 😉 we think hipped. And dual-pitched since the roof pitch changes, pretty dramatically so, in this case. (You might be reminded of the kids’ wooden building blocks where you can top off the structure with that triangular-shaped one.) Anyway, in our go-to reference, A Field Guide to American Houses, the dual-pitched hipped roof is stated as being rare. As for the Craftsman features, one of the most easily recognizable is the unenclosed eve overhang that lets us see part of the roof rafters. 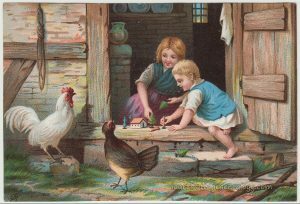 As you’ve noted, there’s no writing on the back of the card to identify the nice family in the photo, or their location. They were the proud owners, no doubt, of this home that was probably new or new-ish when the photo was taken. 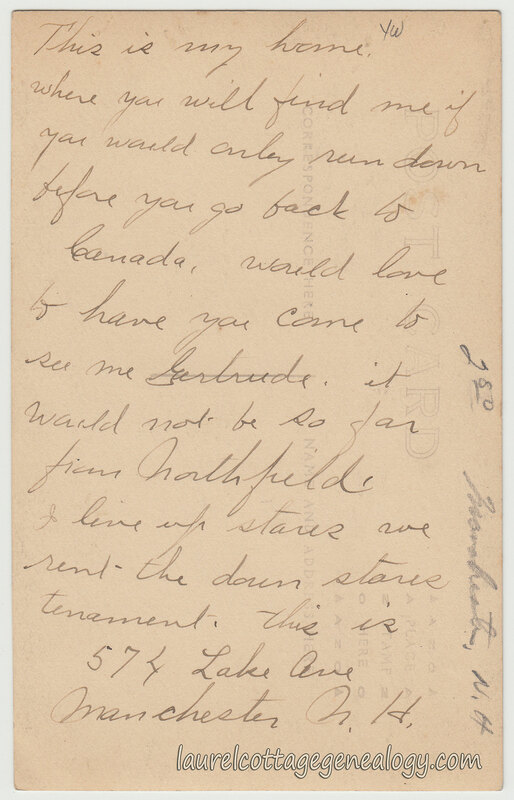 The time-frame is about December 1907 due to the divided back, till the mid-1910s, or so, due to the clothing style and what looks like some evidence of button-top leather shoes, which were prevalent prior to WWI. 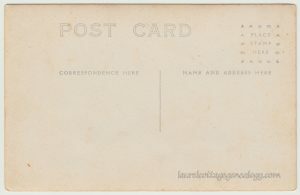 Divided back, Real Photo Postcard. Circa 1907 – 1918. AZO stamp box. 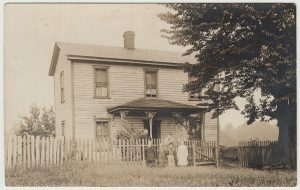 Happily, this house is still standing today, though there have been some changes: The shutters are gone, the trim is different, and the porches on the side have been enclosed. But the garage is still there, the beautiful front porch supports and (thank you) the front door (a double) has been kept. As for the landscaping, the three trees are gone but another tree that looks like it’s been around a good while graces the front yard. Maybe there are other photos of this house already notated for the property, at the local library or nearest historical society, but if not, or even if this photo just shows a different viewpoint, this postcard is a great find, especially if someone were wanting to restore the home to it’s original design. 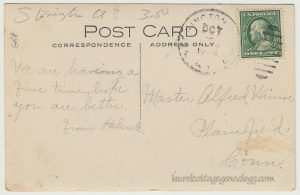 As far as who wrote the card, that would be hard to say, as city directories show a number of possibilities for this approximate time period of 1907 to 1918 (it’s a divided back card so December 1907 per postal regulation changes, and thru about 1918, per the AZO stamp box, all four triangles pointing upward.) But the surnames that are showing up are: Prescott, Bachelder, Chesley, and Healy. Source: Ancestry.com. U.S. City Directories, 1822-1995. 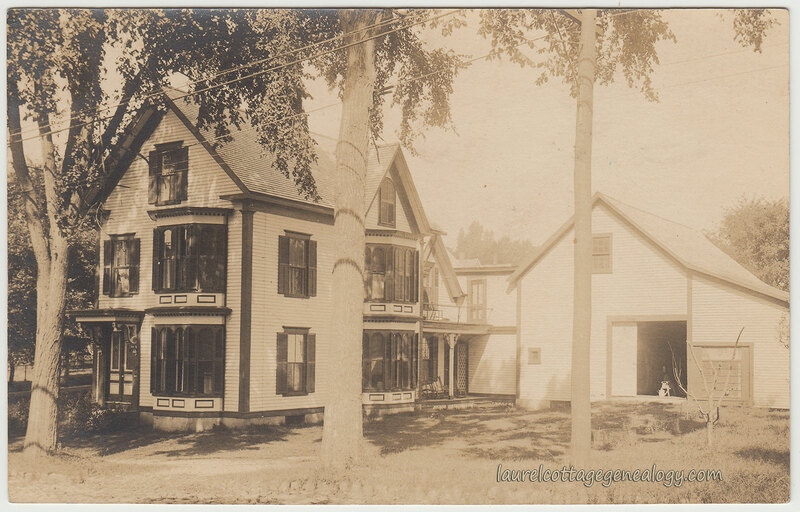 Divided back, Real Photo Postcard. 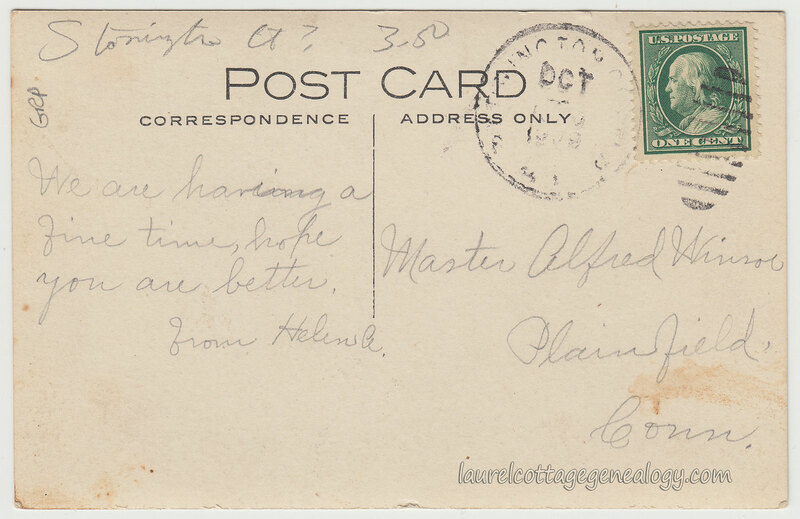 Postmarked October 1909. Location unknown. No matches were found for this beautiful structure (hope it’s still standing) in online research, but we only looked in Connecticut, and didn’t look too extensively. 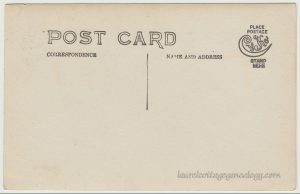 The postmarked town, and thus potential house location, appears to have ended in “-ington” so if it was sent from CT it would have been Ellington, Farmington, Newington, Southington, Stonington or Torrington. 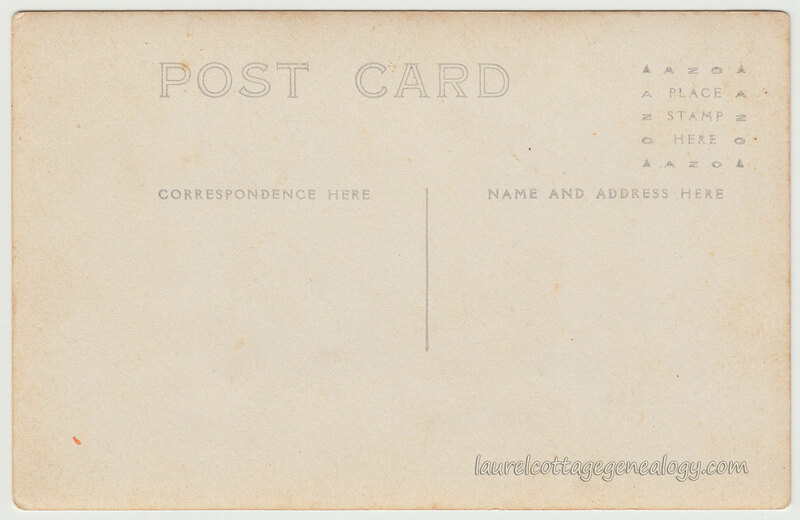 Someone, maybe the previous vendor of this card, was guessing Stonington, per the writing at the top. The cousins would have been about 9 years old at this time. Helen is the daughter of Alfred D. Ashley and Alice Lewis, and Alfred is Alfred Ashley Winsor, son of Edward N. Winsor and Susan F. Ashley. Sources: Year: 1910; Census Place: Plainfield, Windham, Connecticut; Roll: T624_144; Page: 20B; Enumeration District: 0578; FHL microfilm: 1374157. (Ancestry.com). 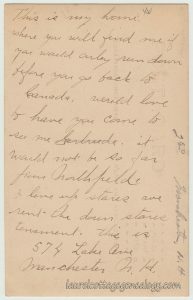 Year: 1910; Census Place: Plainfield, Windham, Connecticut; Roll: T624_144; Page: 27B; Enumeration District: 0578; FHL microfilm: 1374157. (Ancestry.com). 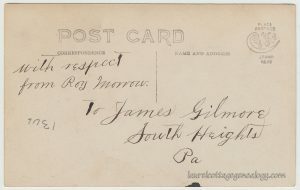 Card, lithograph with initials G.R. for artist, publisher or lithography company. Circa 1880s – 1890s. Here’s some gorgeous color in the midst of a series of mostly black and white photos….A rooster and chicken attend two children at play on the doorstep of the children’s cabin home; the wooden doorstep being the perfect place to set up the little toy house and trees and people….There is no advertisement or identifying writing on the back, but someone had loved this small lithograph. It was found in an antique store in Salinas, CA. The initials G. R. (or R. G.?) that we see in the lower left corner, may be for the artist, the publisher or the litho company, but we’re betting they were for the artist. 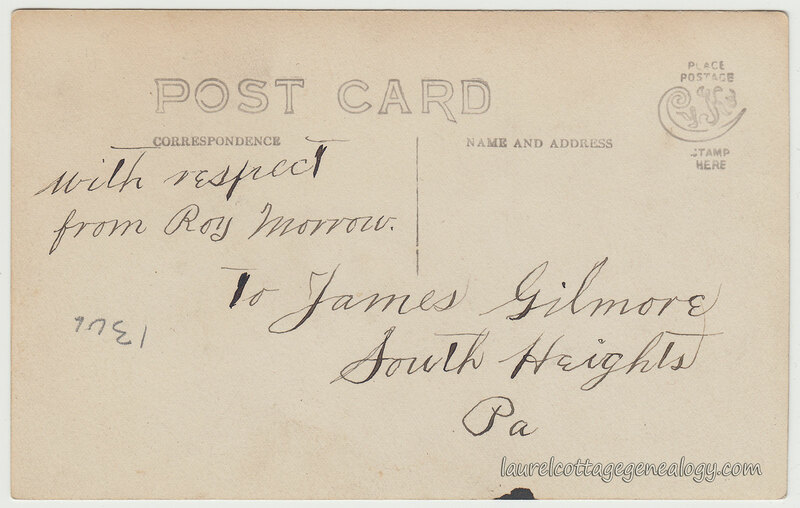 Divided back, Real Photo Postcard, unused. AZO stamp box. Circa 1907 – 1918. Source: Paper bag. n.d. https://en.wikipedia.org/wiki/Paper_bag (accessed September 23, 2018). Old photo, circa late 1890s – early 1910s. 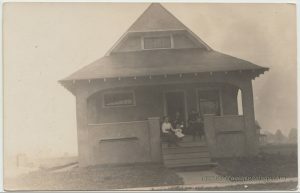 Wouldn’t it be awesome to know the exact locale of this beautiful little house? What’s on the property now? (A million possibilities, there). Who, if anyone, walks on this land now? 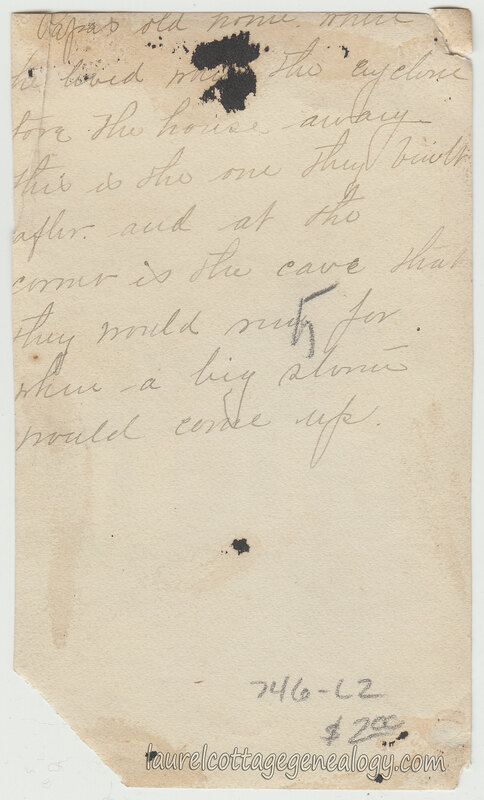 Who did in the past, what tribes of Native Americans lived or hunted here before the settlers came…. ?